Want to find cracks, serial numbers, key generators (keygen), product keys, CD keys or passwords to register your a program, application or software? Whatever is your reason – illegally install, not genuine, no money to pay, forget purchased original valid serial key, lazy to register product, want to extend trial limit and etc – if you search for cracks or serials online, you will likely end up searching, finding, locating and downloading from a few crack sites or cracks search engines. However, these crack sites contain lots of toolbars, popups, spyware, adware, malware or unwanted components that try to infect your computer. Craagle is an utility that helps you to avoid these nuisance. 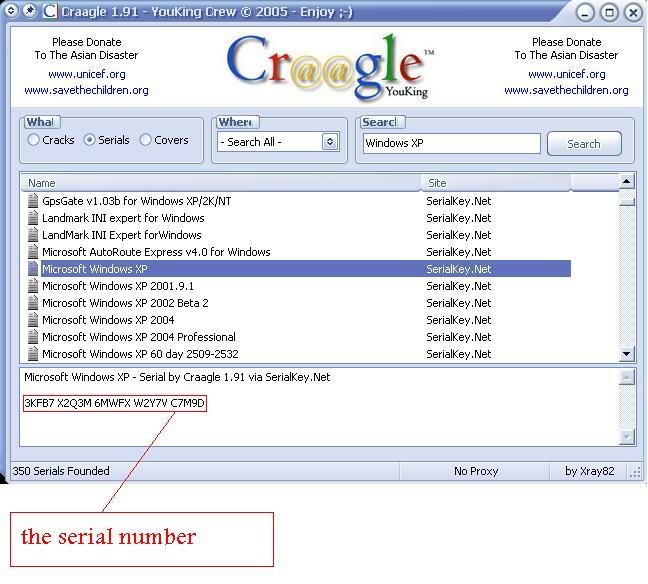 Craagle is a free downloadable standalone meta search engine that allows users to search every sort of cracks, serials, keys, keygen and covers, without falling into annoying toolbars, pop-ups, spyware, ad-ware and mal-ware that the crack sites or search sites abundant with. It works by doing the searching the cracks, serials or album covers directly from Craagle program without the need to visit the websites. Craagle has added advantage of able to search for cover images or graphics for CD, DVD, audio, games and etc. Craagle also supports usage of proxy server to bypass some sites that have Day Limit or daily usage limit. Craagle source code has over 100,000 characters (engine only, excluded GUI). Download Craagle v1.91 (link removed). Craagle is detected by many antivirus and antispyware software as containing Adware, so use it at your own risk. When Craagle is installed, it creates the following files in the current folder: proxy.txt, Options.ini or Craagle.ini.